Prof. Dr. Dr. h.c. Christian Joerges ist Professor of Law and Society an der Hertie School of Governance und Forschungsprofessor für Deutsches und Europäisches Privat- und Wirtschaftsrecht sowie Internationales Privatrecht und Co-Direktor des Zentrums für Europäische Rechtspolitik (ZERP) an der Universität Bremen. Prof. Dr. Florian Rödl ist Professor für Bürgerliches Recht, Arbeits- und Sozialrecht an der Freien Universität Berlin. In a May 23rd Blog, Matthias Kumm reproduces the core arguments laid down in a policy report presented by himself and two other renowned colleagues from the European University Institute, Bruno de Witte and Miguel Poiares Maduro. The report is entitled ‘democratic governance of the Euro’ and proposes ways and means of strengthening the democratic legitimation of EU political practices without altering the European Treaties. The introduction to the report hints at its genesis in a sudden revelation that current European struggles around the Euro are also indicative of democratic deficit in Europe. Reference is thereby made to the fact that thanks to the degree of integration that has been achieved within Europe, policies pursued by any one member state inevitably impact upon its neighbours. This is especially true in the case of national economic and finance policies: At core, crisis is due to a democratic failure that has been formed ‘as between’ member states. However, in choosing to highlight this particular point the report fails wholly to consider the democratic involution and decline to which both the Union and its member states are currently subject. This is both shocking and exasperating. The same may be said of the core suggestions made by the report. The first proposal simply reproduces a strategy that has already promoted by the leading elites of the forces of social democracy in Europe; a strategy which is fortuitously already supplied with its own personnel. That is, European parties should step up to the next European elections with their own leading candidate (Martin Schulz of the Party of European Socialists (PES) is deemed to be a suitable candidate). Whoever wins a relative majority for his party block should subsequently demand appointment to the position of Commission President in defiance of the right of nomination currently apportioned to the European Council. The second proposal is far vaguer, but again lifted from the long-standing aspirational programmes of European social democracy: The more intense regulation of European financial markets, including introduction of a financial transaction tax, the fruits of which should exclusively accrue to the European Union. In our opinion, neither of these proposals is at all convincing; in particular, because neither addresses the real nature of the problems now faced by the European Union. Current problems are without doubt a reflection of democratic deficit within Europe. Nonetheless, the external impacts of national policies are at most only symptoms of malaise within the overall context of monetary union. This is true, even at the simplest level, because monetary union has drastically reduced the macro-economic discretion of member states, and at the same time has landed them with the heavy burden of economic convergence. The focus on peripheral manifestations of crisis fatally misleads in the search for appropriate solutions. Our critique concentrates on the suggestion that European elections should simultaneously act as a poll for the position of President of the European Commission. Proposals on financial reform are left to another day. A growing systemic demand for European correction of national policies is prescribed by virtue of the current structures of European monetary and economic union. On the one hand, the Euro demands economic convergence between member states. On the other hand, thanks to its unitary exchange rate, its unitary bank rate, and soon effectively to be – thanks to the ‘six pack’ and ‘fiscal pact – common budgetary policy, the Euro nonetheless forces member state economies inexorably apart. The member states are expected to act as servants of two categorically different masters, namely the expectation of their citizens that they will respect the democratic institutions and will formation on the one hand, and the macro-economic imperatives as defined by a supranational regulatory machinery on the other. Consequently, because these discrepancies are not simply felt in single member states, but instead impact upon the Eurozone and EU as whole, the Union level must intervene in order to facilitate realisation of macro-economic imperatives. Nonetheless, at the Union level, corrective measures are difficult to pursue in the Council, which is dominated by member states requiring economic correction, with the consequence that the institutional balance of politics within the EU has tilted in favour of the Commission. It is important to note that the dynamics of monetary union have not led and will not lead to more far-ranging integration in the traditional mode: That is, adaptation of member state legal orders in response to harmonising European legislation. Instead, ‘governance of the Euro’ entails situated commissarial oversight of member state democracies in exactly those areas in which member states continue, and should continue to enjoy exclusive competences. The policy report treats these concerns at best with benign neglect In view of current constitutional conflicts and violent daily happenings in Greece, Portugal, Spain or Italy this is an amazing position. If the distinction between traditional processes of ‘integration through law’ and situated commissarial supervision is ignored, or deemed simply to be unproblematic, only one conclusion can be drawn: Potential democratisation can only be achieved through election of the commissarial supervisor, or direct election of the President of the Commission, currently the only elected official at European level. However, since a true direct election would require an alteration in the Treaties, the only available option is an ‘either-or’ direct election of party candidates who have the aspiration of leading the Commission in crisis. The logic is fatally flawed: Unions citizens shall, via election of the European Parliament concomitantly select the Commission President of the Commission as their leading figure who will gain a growing measure of authority to tell member states and national citizens exactly which of their democratically legitimated policies are acceptable at Union and which not. Member state democracies will still be subject to commissarial supervision; the only difference being the fact that this constellation is supposedly legitimated by election of the head of the supervisory authority. Is it really conceivable that this proposal will win the hearts of the citizens of states that subject to supervision; above all those whose existence is threatened by the massive reduction in wages and slashing of social provision which we now know count amongst the macro-economic imperatives of the governance of monetary union? We do not believe so: Instead, any reference to the ‘new democratic legitimacy of the Commission President’ can surely only be viewed as a very sick joke by Greek, Spanish or Portuguese citizens who are so heavily impacted upon by crisis. Citizens will not accept the results of any election which so clearly undermines the principle of ‘one man one vote’; and nor should they, unless we wish to depart from the primary principle of democratic theory that authoritative law derives its legitimation from equal representation in law-making (at the very least, those who are in effect arguing for such a departure should first justify it in theoretical terms). Democratic tradition in Europe has traditionally been hostile to the direct election of the executive, seeking instead to restrain executive power and subject it to boundaries set by legislative law-making. A sceptical stance towards the establishment of ‘personal representation’ by means of direct election of the head of the executive is all the more justified where the countervailing democratic powers of parliament, parties, civil society organisations and the public sphere are as underdeveloped as they are in the Union. Without doubt, conservatives and social democrats would, in the current context, compete fiercely for the position of Commission President. The electorate, however, is more likely to divide along the north-south wealth axis, than abide by traditional left-right distinctions. It may well be true that a good number of post-postnational social democrats will subscribe to a notion of austerity which impacts only upon other countries and minimises the potential liabilities carried by their own member states. A direct election would only deepen the social cleft within the Union, failing to provide democratic legitimation and instead casting the ‘democratically-elected’ Commission President in the role of symbol for this division. We refrain from adding further points to this list. * Translated by Michelle Everson, University of London, Birkbeck College. Policy-Report “The Euro Crisis and the Democratic Governance of the Euro: Legal and Political Issues of a Fiscal Crisis”, presented to the High-Level Policy Seminar “The Democratic Governance of the Euro”, 10 May 2012 (available at http://globalgovernanceprogramme.eui.eu/research-publications-2/strands/modes-of-global-governance/). Further opinions on this seminar will be published in a Compiled Memorandum, including a contribution by Ch. 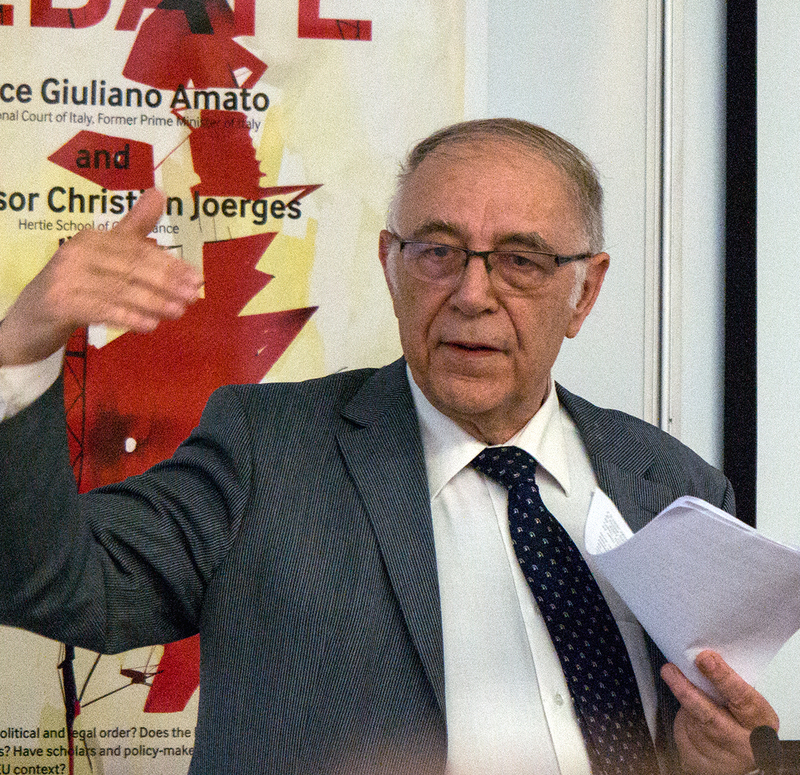 Joerges (“The Economic Constitution in Crisis“). SUGGESTED CITATION Joerges, Christian; Rödl, Florian: Would the election of a Member of the European Parliament as President of the Commission make democratic sense?, VerfBlog, 2012/7/04, https://verfassungsblog.de/election-member-european-parliament-president-commission-democratic-sense/, DOI: https://dx.doi.org/10.17176/20170524-113345. I will be fascinated and also thinking about what you are writing about here.